Beijing has been retrofitting single-warhead ICBMs with multiple, independently targetable re-entry vehicles. An advanced variant of the Dongfeng 5, the DF-5B, was displayed during Beijing’s grand military parade to commemorate the 70th anniversary of the surrender of Japan and the end of the Second World War, held in September 2015 (See: “Here’s What You Need to Know About China’s Grand Military Parade”). The liquid-fueled DF-5B purportedly has a range of 12,000-15,000 kilometers (6,835-7,456 miles). 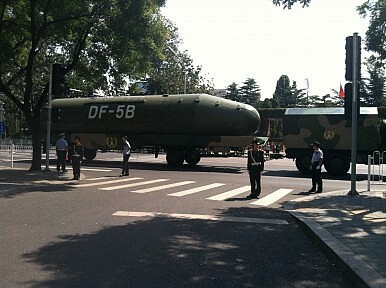 Overall, the PLARF is estimated to possess 20 Dongfeng DF-5B ICBMs, although some analysts believe that the number of missiles has increased beyond 20. “When you add the possibility of MIRVed DF-5s exceeding 20, to the imminent deployment of the road-mobile and rail-mobile MIRVed DF-41, and the potential for a MIRVed version of the DF-31 called the DF-31B, it becomes possible to consider that China may reach 500 or more ICBM warheads in the next few years,” Rick Fisher, a China military analyst, told The Washington Times. “This, combined with China aggressive development of missile defenses, space warfare capabilities and possible non-nuclear prompt global strike missiles, will quickly undermine confidence by U.S. allies in the extended U.S. nuclear deterrent,” he added. “High-confidence assessments of the numbers of Chinese nuclear-capable ballistic missiles and nuclear warheads are not possible due to China’s lack of transparency about its nuclear program,” the latest U.S.-China Economic and Security Review Commission report notes. The DF-5 missile series will eventually be phased out and replaced by the solid-fueled DF-41 (CSS-X-20) ICBM, last tested in August 2015 (See: “China Tests New Missile Capable of Hitting Entire United States”). Once operational, it will be the PLARF’s most advanced ICBM to date. The re-engineering of China’s ICBM force has been known for some time, although no unclassified assessment has so far been been able to confirm details of China’s ICBMs modernization effort. Why is China pursuing MIRVs now and what does this mean for regional stability?